ZuPreem® AvianEntrées™ Diets are ultra premium, everyday diets formulated to meet the accepted nutrient requirements for the maintenance of adult psittacines (hookbills) and most passerines (softbills). 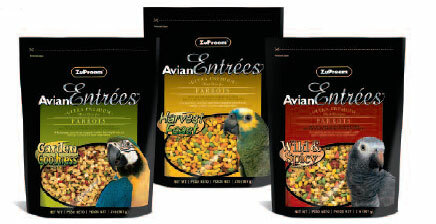 The three AvianEntrées mixes contain different assortments of nutritious extruded nuggets with the highest quality fruit and vegetables, providing birds with a wide variety of choices. GARDEN GOODNESS™ MIX offers wholesome nuggets with no added colorants mixed with nature’s own red and green peppers, peas, tomatoes and apples. Appeals to bird owners who want to feed a more natural diet. Shelf-life: One year from date of manufacture. ZuPreem® AvianEntrées™ Diets are formulated for adult nonbreeding birds and should be the bird’s primary source of nutrition.AvianEntrées Diets are convenient and ready to serve. Shake the bag before each serving so the bird can enjoy the complete mix of nuggets, fruit and vegetables. Feed free choice and check that the bird always has food in his cup, as well aaccess to fresh clean water. Do not leave moistened food in the cup for long periods of time. Most birds consume 20% of their weight per day to maintain optimum body condition and help prevent excessive thinness or obesity. For complete nutrition, make sure the ZuPreem diet or combination of diets being fed makes up at least 80% of what the bird eats every day, especially if the ZuPreem diet is supplemented with other food items. ZuPreem diets have precise levels of essential vitamins and minerals, and adding additional supplements to AvianEntrées™ Diets is not required and could be harmful to the bird. Mix the AvianEntrées diet with the current food, slowly increasing the proportion of the AvianEntrées diet and decreasing the proportion of the previous food over the course of 10 to 14 days minimum. Most birds find all AvianEntrées mixes very tasty and convert easily. Monitor the color of the bird’s droppings to ensure they are well formed.The color of the droppings may change as a result of a dietary change. If the bird is currently on a high seed diet, he may be difficult to convert and refuse to eat. If he begins to lose weight, return to his original food and contact an avian professional. For complete conversion methods, go to ZuPreem.com/conversion. Note – As an indicator of health, always monitor for changes in weight and body condition. Provide adequate amounts of food to maintain body condition, preventing excessive thinness or obesity. Always provide clean, fresh water. Store in a cool dry place, free of pests and insects. Gently push air from bag and reseal immediately after use.